A unique place to spend unforgettable days in the company of your family. A unique place to spend unforgettable days in the company of your family. Fully equipped for you to not only enjoy the scenery, but of his own rest. In our homes can enjoy the tranquility of the countryside in a secluded virgin can see the horizon and the sea without sacrificing any modern home comforts. 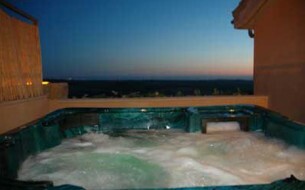 Apartment for two persons, double bed, individual terrace with table and chairs, bathroom with Jacuzzi and fireplace. It has a fully equipped kitchen, stereo, DVD and stereo. Apartment located in a rural complex near Taberno, a small town, its streets and whitewashed generous flowers, which are the Church, the many squares and small squares that flirty expect their streets to spread our visit more meaningful. The rise in the chapel of Calvary where as we advance in our ascent we enjoy views of the entire town to reach the top, where we see the horizon bathed the beaches of Garrucha . The peaks of the Sierra stays completed this fabulous views, the landscape desmereix not our focal point, as close to the Sierra stays, make Taberno a place to rest and enjoy your peculiar and traditional cuisine.